Ganesh Chaturthi – or Vinayaka Chaturthi, Chavath, or Lambodhara Piranalu depending on where you live – is one of the biggest Hindu festivals of the year. 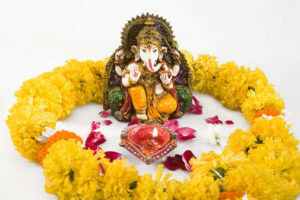 Occurring at the end of India’s four month monsoon season and at the beginning of the harvest season, Ganesh Chaturthi invokes the elephant-headed God Ganesh for a bountiful harvest. There is a lovely environmental meaning to the Ganesh Chaturthi festival. Ganesh idols were originally fashioned from the clays of area water bodies prior to the monsoons so as to clean the waters of silt deposits. Part of the festival involves Ganesha devotees celebrating their local region’s natural history by gathering 21 symbolic non-agricultural medicinal plants for inclusion in an offering to the idol. Traditionally at the end of the festival the idols were returned to waters from which their materials were taken, often with the plant and other offerings. 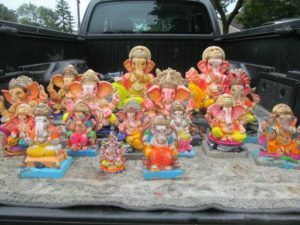 In the past decades, Ganesha idols in India and the United States have been constructed out of non-biodegradable Plaster of Paris, plastic or metal, and painted with toxic paints. And it is often the case that idols are abandoned in rivers, lakes, streams or the ocean at the end of the festival. These idols can take several years to fully dissolve, if they dissolve at all. This leads to lowering of oxygen levels and contamination of our water bodies. Unfortunately the Lower Raritan Watershed Partnership and partners have found many dozen abandoned idols in area waters over the years. As the negative environmental impacts of abandonment of Ganesh have been recognized, practices have been adopted to minimize these impacts. Increasingly clay and mud idols are crafted with a seed inside them, painted with non-toxic rice paste and vermillion, and then buried or planted in home gardens instead of being immersed or abandoned in area waters. 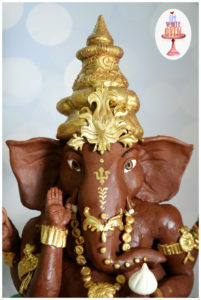 We have also heard about a new way of making the Ganesha idol: that is by using modeling chocolate. The Ganesha idol is made using chocolate, and at the end of the festival the idol is immersed in milk. The chocolate is then distributed among celebrants, or provided to the homeless. Chocolate Ganesha – it dissolves in milk! In the United States it is a violation of the Federal Clean Water Act to pollute or discharge ANY items (biodegradable or otherwise) into waterways without a permit. It is now the case that many Hindu temples and other other cultural institutions secure permits for temporary immersion of the idols in the Raritan River and area streams. That is, celebrants bring their Ganesha to a public ceremonial immersion event and then reuse their idols the following year. We applaud those who celebrate Ganesh Chaturthi in an environmentally friendly fashion. For those who celebrate Ganesh Chaturthi we wish you happiness as big as Ganesh’s appetite, life as long as his trunk, trouble as small as his mouse, moments as sweet as modaks, and a healthy and clean environment in which to honor Ganapati and his gifts. Happy Ganesh Chaturthi!